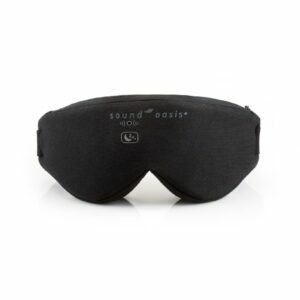 Fall asleep faster, block out external light and wake up more refreshed with illumy – the smart sleep mask. App control gives you the ability to tailor your sleep experience and get the best rest possible. Sleep better and wake refreshed with your own personal sunset and sunrise. Our modern lifestyle often prevents us from receiving natural cues that aid in a healthy sleep cycle. 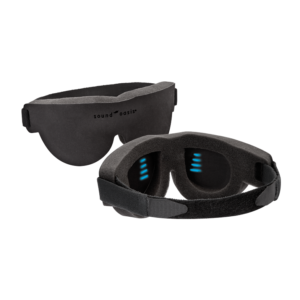 The illumy smart sleep mask is a comfortable and lightweight smart sleep mask that blocks out unwanted light and provides its own light to trigger your body's natural responses. Blue tones wake you gently and effectively in the morning before your chosen alarm time, and red-toned light helps you fall asleep at night. These are the same light cues used by NASA to regulate sleep on the space station. Find out what happened when Catherine, a guest on the Rachael Ray Show, tested illumy and shared her experience: Press play on the video below to find out what happened - Amazing! "It's comfy. 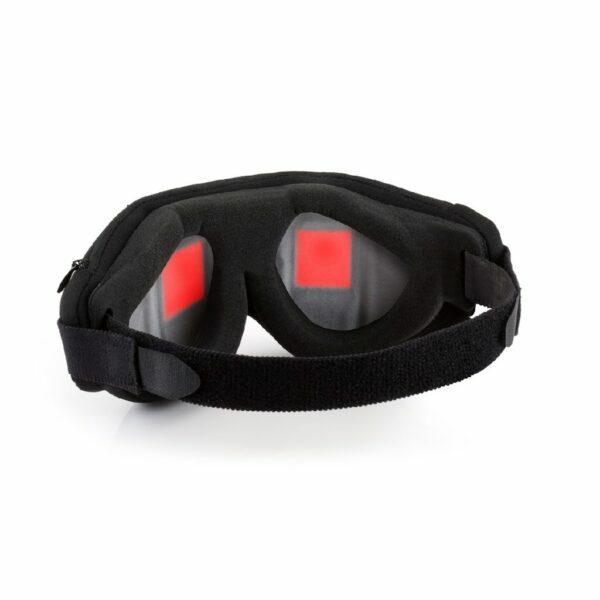 I fell asleep right after the red pulsing lights and was able to sleep through the night!" "Wow, this thing is a game changer for me!" "It gradually puts you to sleep and wakes you up with your own personal sunset and sunrise. Sweet Dreams!" 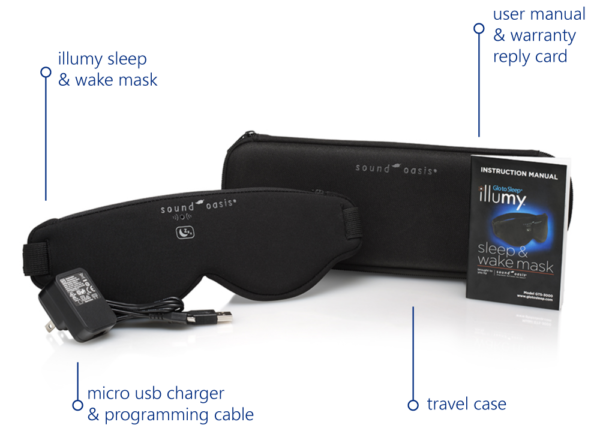 "Helps your mind and body pull itself in and out of a sleep cycle"
"Catching some zzz's on the road can be tough, so this gift is perfect for the entrepreneur who needs to get some shut-eye while on the go"
illumy contains a wake-up light alarm clock in a sleep mask. 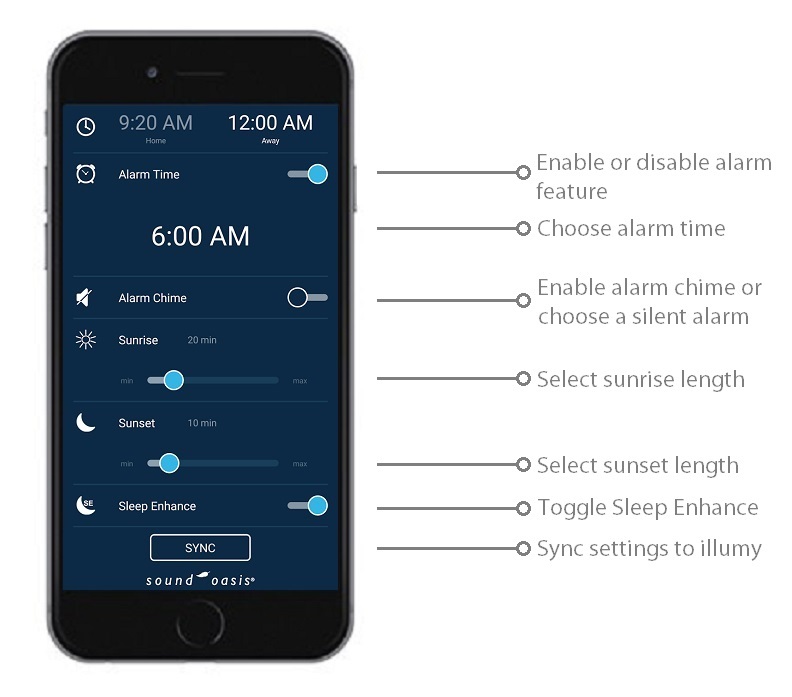 Set your alarm time with the free Android, iOS or web App and illumy will wake you up with a brightening sunrise. 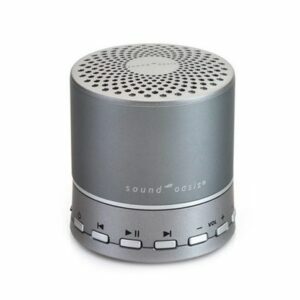 Choose to enable the audible chime alarm or silent alarm. The silent alarm wakes you up with a sunrise simulation that gets brighter as your alarm time approaches. Fall asleep quickly with your choice of 10 to 60 minute long sunset. Wake up to an invigorating blue enriched sunrise with a duration of 10 to 60 minutes. You may select the length in the App. Perfect for traveling, choose your time zone before you get to your destination. illumy's internal clock will take care of time zone calculations for you. Choose the time zone of your destination and set your alarm. When you arrive, illumy will be ready to wake you up. 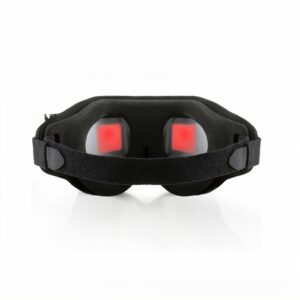 Product dimension : 11" x 4.5" x 1.75"
Package dimensions : 11.75" x 4.75" x 2.5"
illumy helps you fall asleep faster with gradually dimming sunset-colored lights. In the morning, illumy will begin illuminating blue light like a bright sunrise before your chosen alarm time. 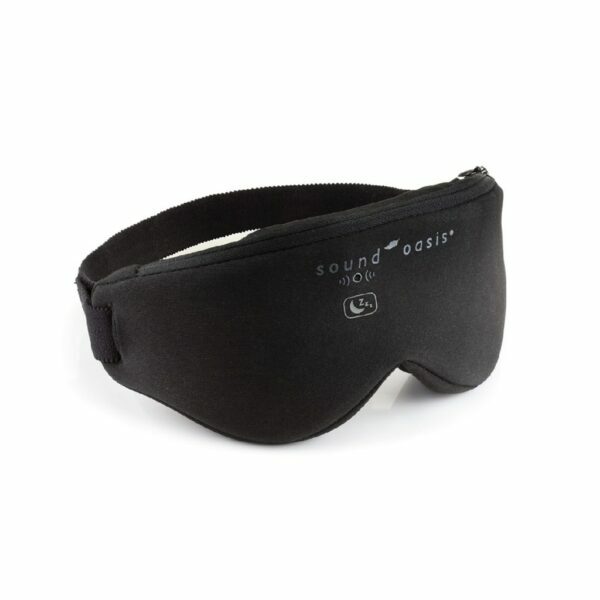 For stubborn insomniacs, our optional Sleep Enhancement® technology helps nudge users into sleep with pulsing lights. These lights pulse at slower Delta frequencies at bedtime and faster Alpha frequencies in the morning. illumy blocks all outside light that can keep you awake or interfere with your natural melatonin flow. illumy works for a power nap too! Set the sunset to "off"
Q: Can you adjust the brightness of the illumy sunset? A: Yes. In the sunset mode, press and hold the sleep button. The red sunset will dim as you hold the button. Release your finger when you have reached your preferred sunset brightness. Q: Will the head strap fit both large and small heads? 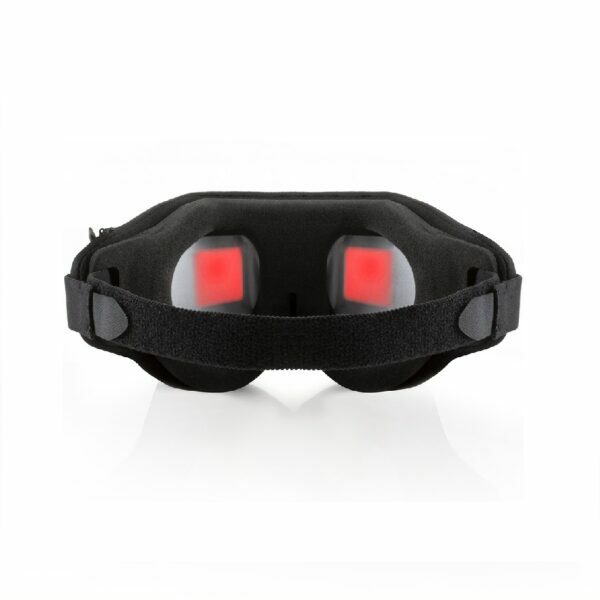 A: Yes, the illumy has an adjustable Velcro® strap so it comfortably fits all sizes of heads. 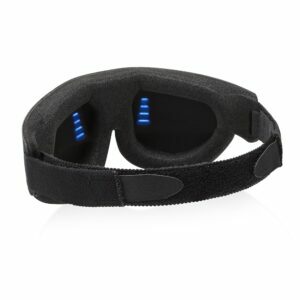 Q: How does the Sleep Enhancement work? A: If you suffer from insomnia or need extra help waking up, our optional Sleep Enhancement® technology uses pulsing lights to help. At bedtime, the dimming sunset will pulse at increasingly slower Delta frequencies consistent with falling asleep, and in the morning the “blue sky” light will pulse at increasingly faster Alpha frequencies to assist with waking and alertness. You can turn this feature on or off in the illumy app. Q: Can you only adjust the illumy settings with the illumy app on a smartphone or tablet? A: No, you can also program your illumy using your computer by visiting this page on the Sound Oasis website: www.glotosleep.com/programmer/. Select your illumy alarm settings, connect your illumy to the computer with the programming cable, and press the sync button. Q: Do I need to use illumy every day? A: Everyone is unique. Some people use the sunset every night to distract from racing thoughts and their unreasonably long to-do lists. Some people use the sunset on nights when it’s particularly difficult to fall asleep (the same way a lot of people use our nature sound machines). Others use illumy during particular seasons of the year. December to March can be pretty dreary in the morning, and one of the best ways to overcome this sleep inertia is with illumy's sunrise. Over time you’ll find the right combination, but we think a lot of people are going to enjoy illumy every day. Q: Where can I download the illumy App? Q: How long can I expect the battery to last? A: If you use illumy every night, you can expect about 2 weeks of battery life. This will depend on your settings of course. Shorter sunset and sunrise settings will extend this time. Q: illumy has a washable cover – what is the best way to wash it? The foam can also be washed with a mild detergent and warm water using a soft cloth. Q: Does illumy come with a warranty? A: Yes. 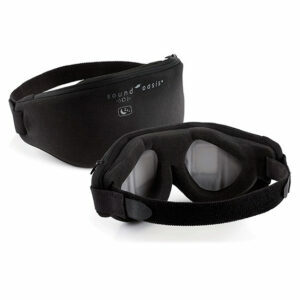 Your sleep mask is covered by a one year replacement warranty. Q: Do I need Bluetooth to program illumy? A: We designed illumy to use a platform independent programming method. Your settings can be synced using most mobile phones, PCs and Mac devices. Since we use audio tones to program illumy, just about any device with a browser and sound output can be used to transfer your settings to your sleep mask. No pairing, no conflicts between multiple devices and no worries about compatibility. Of course, the most convenient way to program your sleep mask is using the iPhone or Android App. Q: Do I need to use the programming cable to sync my settings? Q: Will illumy help me stay asleep during the night? A: It sure does. Illumy is designed to block out external light. If someone turns on the light during the night, you won’t even notice. Q: I often work night shift, can I use illumy during the day? A: illumy is ideal for night shift workers who need to sleep during the day. The red sunset helps you relax and prepare for sleep and the blue sunrise will help you get ready for that next overnighter. The alarm can be set for any time of day or night. Q: Are there other ways I can use illumy? A: illumy can also be used to get a boost in the afternoon. A power nap has been shown to increase productivity while exposure to blue light can boost alertness. Why not combine the two? Set a 10 minute sunrise for 30 minutes from now, put on illumy and wake up refreshed after a 30 minute nap. Catherine, a viewer from the Rachael Ray Show, tested illumy for herself and came away impressed! The app is amazing! Very simple and easy to use. I can wake up at insanely early hours and not wake up my girlfriend. It's literally no sound at all so it's perfect. It's also great to wake up to light, it does feel more energizing.